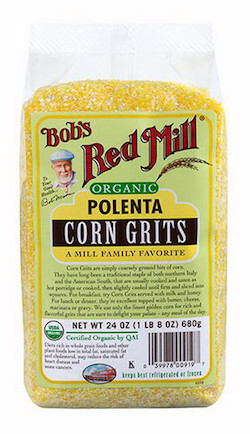 Bob's Red Mill Corn Grits are made using only the finest golden corn for a rich flavor that is sure to please your palate, any meal of the day. Native Americans offered the first settlers in the US bowls of Rockahominie, a dish consisting of ground up corn grain cooked into a creamy mixture. It is believed this corn mixture kept many of the settlers alive during those cold winters. Today, corn grits hold a prominent place in soul food and southern dishes. They are also used as a side or a pairing with dishes containing very heavily spiced ingredients. Grits may be eaten covered in gravy, cheese or butter and salt; or served with seafood, meats or vegetables. Grits also make a delightful breakfast when served as a hot cereal topped with milk and honey or brown sugar. Grits are a great way to help meet your body's daily vitality needs. The fiber content in grits helps you feel full for longer periods of time and promotes regular digestive functioning. Polenta is a dish that has been popular in Italian and other European cuisine, and is now gaining fans in America as well. It is made from course ground corn (grits), boiled in water to create a porridge. This can be topped and served immediately for a warm corn side dish. Corn Grits make a delicious bowl of porridge and can also be used for the classic Italian dish polenta or the Southern classic shrimp and grits.